previous post: Are they all lining up to be Japan? As background you might like to read this blog – Functional finance and modern monetary theory – for more discussion. In an open economy, if there was no government spending or taxation (so a fiscal balance of zero) the level of economic activity (output) will be determined by private domestic spending (consumption plus investment) and net external spending (exports minus imports). If one or more of those spending sources declines, then activity will decline. A spending gap is defined as the spending required to create demand sufficient to elicit output levels which at current productivity levels will provide enough jobs (measured in working hours) for all the workers who desire to work. A zero spending gap occurs when there is full employment. From a functional finance perspective (outlined in the blog above) the role of government fiscal policy is obvious – to ensure there is no spending gap. It becomes obvious (and incontestable) that if the private spending sources decline from a given position of full employment, the only way that the spending gap can be filled is via a fiscal intervention – direct government spending and/or a tax cut (to increase private disposable income and stimulate subsequent private spending). That is a core insight of functional finance which underpins MMT. Another way of thinking about this is to start simply. The left-hand side of this equation always is brought into equality with the right-hand side via income adjustments (that is, variations in the level of aggregate activity brought about by spending variations). That is the essential first-principle involved in understanding how the macroeconomy works. So if for example, Private Investment increases (G and X constant) this stimulates aggregate demand (spending) and firms react by increasing output to meet the new orders. This requires them to increase employment and the increased income is then used to increase saving (S), pay more tax (T) even if tax rates are unaltered, and increase imports (M). The economy stops expanding again once the change in Investment is equal to the sum of the changes in S, T and M. This dynamic response and subsequent resolution is what we term an movement to a new equilibrium response. The left-hand side (I + G + X) are called injections – because they inject new demand into the economy whereas the right-hand side (S + T + M) are leakages – because they drain aggregate demand, where aggregate demand is the total spending in a domestic economy per period (say a quarter or a year). Implicit here is the fact that the increase in investment stimulated rising consumption (C) and the induced consumption stimulated subsequent increases in income and so on. That is the basis of the spending multiplier. Please read my blog – Spending multipliers – for more discussion on this point. A macroeconomy is in a steady-state (that is, at rest or in equilibrium) when the sum of the injections equals the sum of the leakages. The point is that whenever this relationship is disturbed (by a change in the level of injections, however sourced), national income adjusts and brings the income-sensitive spending drains into line with the new level of injections. At that point the system is at rest. Three points should be noted. First, this position of “rest” does not necessarily have to coincide with full employment. The system will adjust to dramatically lower levels of injections and come to rest even if there are high unemployment levels. This was denied by the mainstream orthodoxy who fought it out with Keynes (and Marx before him). One contribution of Keynes was to convince the Western academics (who didn’t want to be convinced by Kalecki or Marx) that economies could settle at very high levels of unemployment and would stay there unless budged by an intervention (that is, a fiscal policy stimulus). Second, when an economy is “at rest” and there is high unemployment, there must be a spending gap given that mass unemployment is the result of deficient demand (in relation to the spending required to provide enough jobs overall). Please read my blog – What causes mass unemployment? – for more discussion on this point. Accordingly, if there is no dynamic which would lead to an increase in private (or non-government) spending then the only way the economy will increase its level of activity is if there is increased net government spending – this means that the injection via increasing government spending (G) has to more than offset the increased drain (leakage) coming from taxation revenue (T). That is, a fiscal deficit is needed because there is a non-government spending gap. I + X < S + M then the only way the level of activity can be maintained on an on-going basis (at any rate of unemployment) is if G > T. That is a fiscal deficit is required on a continuous basis to sustain a given level of activity. In this case, a fiscal deficit “finances” the desire by the non-government sector to save by maintaining sufficient demand to produce a level of income which will generate that level of net saving. 1. The discretionary fiscal position (deficit or surplus) must fill the gap between the savings minus investment minus the gap between exports minus imports. Which in English says for income to be stable, the fiscal deficit will equal the excess of saving over investment (which drains domestic demand) minus the excess of exports over imports (which adds to demand). If the right-hand side of the equation: (S – I) – (X – M) – is in surplus overall – that is, the non-government sector is saving overall then the only way the level of national income can remain stable is if the fiscal deficit offsets that surplus. So lets call S(Yf), M(Yf) the corresponding flows that are defined at full employment income (Yf). We also consider investment to be sensitive to national income (this is outlined in the so-called accelerator theory) such that higher levels of output require more capital equipment for a given technology. So I(Yf) might be defined as the full employment flow of investment. We consider export spending to be determined by the level of World income. In this sense, MMT specifies a strict discipline on fiscal policy. It is not a free-for-all. If the goal is full employment and price stability then the Full-employment fiscal deficit condition has to be met. How many times have you read any of this in IMF, OECD or other official documents over the last 30 years – the neo-liberal years? Answer: never! As we examined in the blog – Life in the IMF fantasy world – the IMF constructs the fiscal condition in an entirely different way – divorced from the rest of the macroeconomy. That is, G – T = 0 when calculated over the “lifetime” of the government (the “intertemporal fiscal constraint” to use the jargon). That is, pure unadulterated nonsense. It tells you nothing about the saving and spending preferences of the private sector. It tells you nothing about the dynamics of the external sector. It creates a faux framework by assuming that “the present value of the excess of future expenditure and current liabilities over future receipts is zero” (Why?) and then the conclusion follows – fiscal balances should be in balance over the infinite horizon. This framework erroneously assumes that this is a financing constraint and fiscal deficits have to be “paid back” by which they mean the debt issued to “finance” the deficits have to be paid back via primary fiscal surpluses (excess of taxes over government spending). Clearly, a sovereign government is never revenue constrained because it is the monopoly issuer of the currency. As such, the mainstream (IMF) framework misses the point entirely. The entire mainstream discussion about fiscal consolidation and fiscal sustainability and the limits of fiscal policy is based on false premises. It has no application to modern monetary economies. From the perspective of Modern Monetary Theory (MMT), the whole question of fiscal sustainability has to be in terms of maintaining full employment and price stability. The Full-employment fiscal deficit condition provides the focus for policy makers in this regard. Please read the suite of blogs – Fiscal sustainability 101 – Part 1 – Fiscal sustainability 101 – Part 2 – Fiscal sustainability 101 – Part 3 – for more discussion on this point. So before we question whether the “limits” of prudent fiscal policy have been reached we need to collect information from the labour market rather than the bond markets. The existence of mass unemployment is striking evidence that the fiscal deficit is too small and needs to be expanded. One way the mainstream gets around this obvious point is to contest the definition of full employment. Accordingly, they invoke a bastardised concept of full employment which they call the Non-Accelerating-Inflation-Rate-of-Unemployment (NAIRU) which says that the economy is fully employed when inflation is stable (irrespective of how many workers are unemployed or underemployed). Further, if the government doesn’t like that level of unemployment and/or underemployment (perhaps for political reasons) then the only way they can reduce the NAIRU without causing inflation is to operate at a structural level – less regulation, lower welfare benefits, cutting wages particularly minimum wages). In other words, fiscal policy initiatives designed to influence aggregate spending are futile at best and highly inflationary at worst. In terms of the MMT Full-employment fiscal deficit condition, policy designed using some estimate of the NAIRU (which are always above what a reasonable definition of full employment might be) will cause the economy to settle at levels of national income (and real GDP growth) that are insufficient to generate enough jobs. The mainstream NAIRU-based policy framework, followed by the IMF, the OECD and central banks etc is biased towards entrenching mass unemployment and pressuring policy makers to introduce pernicious anti-worker and anti-equity policies under the guise of structural reform. Please read my blogs – The dreaded NAIRU is still about! and NAIRU mantra prevents good macroeconomic policy – for more discussion on this point. The OECD, the organisation that has spearheaded the abandonment of full employment in all its member countries since releasing the supply-side blueprint in 1994 – The Jobs Study, seemed somewhat oblivious to the fact that all the policies that governments introduced under their guidance which allegedly made labour markets resilient and flexible through active labour market programs (scrapping worker protections, undermining welfare payments and wages, attacking trade unions etc) failed to prevent the major economies from going belly up once aggregate demand collapsed. Some 15 years after the OECD Jobs Study was released, the OECD economies still generated high unemployment rates and broader forms of labour underutilisation have increased. The trend to part-time and casualised employment which fails to provide enough hours of work to match the preferences of the workforce is widespread throughout OECD countries. There is also strong evidence to show that active labour market programs of the type praised by the OECD have been largely ineffective in reducing unemployment and improving the outcomes of the most disadvantaged workers in the labour market. The situation will worsen in the current downturn. In the period before the crisis, it was difficult to see what has been achieved by the supply-side labour market policies other than to punish the most disadvantaged workers in our communities. Please read my blogs – The OECD is at it again! and The OECD should close and its staff redeployed into productive activities – for more discussion on this point. After 12 years or so of preaching that more deregulation was necessary, in the face of the fact that unemployment remained high, the OECD themselves started to recant a little. In 2006, the OECD started to acknowledge that its policies were failing and were based on wrong modelling. Over the last 20 years or so, many academic studies sought to establish the empirical veracity of the orthodox view that unemployment rose when real wages, welfare payments and workplace protections increased. This has been a particularly European and English obsession. There has been a bevy of research material coming out of the OECD itself, the European Central Bank and various national agencies, in addition to academic studies. The overwhelming conclusion to be drawn from this literature is that there is no conclusion. These various econometric studies, which have constructed their analyses in ways that are most favourable to finding the null that the orthodox line of reasoning is valid, provide no consensus view as has been shown convincingly by several studies (including work of my own). Partly in response to the reality that active labour market policies did not solve unemployment and instead created problems of poverty and urban inequality, some notable shifts in perspectives became evident among those who had wholly supported (and motivated) the orthodox approach which was exemplified in the 1994 OECD Jobs Study. … the evidence of the role played by employment protection legislation on aggregate employment and unemployment remains mixed … [and that the evidence supporting their Jobs Study view that high real wages cause unemployment] … is somewhat fragile. These conclusions from the OECD in 2006 confounds those who have relied on its previous work including the Jobs Study, to push through harsh labour market reforms; retrenched welfare entitlements; and attacks on the trade unions. It makes a mockery of the arguments that minimum wage increases and comprehensive employment protection will undermine the employment prospects of the least skilled workers. OECD (2006) found that unfair dismissal laws and related employment protection do not impact on the level of unemployment but merely redistribute it towards the most disadvantaged – including the youth who have not yet developed skills and have little work experience. We examined all this literature in our 2008 book – Full Employment abandoned. Fast-track to 2009 – at the height of the crisis, the OECD released a Report (September 16, 2009) – Governments must act decisively on jobs – where, in relation to fiscal policy OECD acknowledged “that these measures are playing a positive role”. They were still pushing the structural ideas but in a toned down form and acknowledging that the fiscal interventions (stimulus packages) were playing a positive role to attenuate the rise in unemployment. That humility didn’t last long. Fast-track to April 2011. In their latest Going for Growth 2011 report (Published April 7, 2011) you see that the OECD is back to their dirty old ways. … most mature economies are growing at a pace that is insufficient to reduce unemployment significantly … As the capacity of fiscal and monetary policies to further support the recovery runs out, a new emphasis on structural reforms is the only way to boost growth and job creation. In fact, unemployment continues to rise overall. 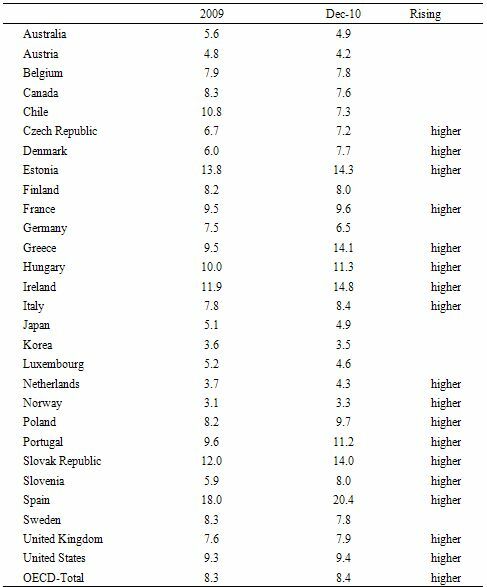 The following table is taken from the OECD’s own Harmonised unemployment rate data. Note these are all computed on common labour force definitions. The data compares the average for 2009 with December 2010 for OECD countries with published data. There is data for February 2011 which is incomplete and shows slight improvements in some nations and worsening situations in other nations. But the point is not substantially altered using December 2010 figures. While the crisis remains (relative to their 2009 statment) the emphasis has now changed remarkably. According to this corrupt institution, there is no longer anything positive that fiscal policy can do to reduce unemployment and governments have to go back to more deregulation, more wasteful training programs designed to force compliance on income support recipients, more attacks on welfare benefits and minimum wages and the rest of it. Well here is a question. Imagine the US government announces a Job Guarantee today whereby the federal government would provide a minimum wage job (at a realistic socially viable minimum wage) to anyone who wanted to work and couldn’t find employment elsewhere. The jobs would be permanent and involve community and environmental development activities. There would be no other income support available from government for those who were capable of working. All other income support would be maintained (aged pensions, sickness and disability support pensions). Question: How many workers would report to the Job Guarantee depot next morning for work? The OECD thinks none. I think millions. The challenge to conservatives is that if they really believed that the unemployment was an entirely structural problem they should have not fear of a Job Guarantee program because no-one would turn up for it and the fiscal outlays would be minimal – running an office that does nothing! The reality is that they fear such a program would be very successful. You might like to read this blog – Boondoggling and leaf-raking … – where I outline in some detail the responses that we received in 2004 after tha Australian Local Government Association (the peak body of Local Governments in Australia) endorsed a Job Guarantee proposal that I had put forth. This was in fact a modified Job Guarantee which we called the Community Development Job Guarantee and involved guarantees to the long-term unemployed and a Youth Guarantee providing education, training and employment for young unemployed people. We wanted to test the political water and saw this as a transition to a full unconditional Job Guarantee for anyone who didn’t have work and wanted it. The ALGA wrote to the then Federal Minister for Employment and Workplace Relations Kevin Andrews and received a reply on August 13, 2004 outlining why the Government rejected the Job Guarantee. You can download this stunning document HERE. If you read the then Minister’s response, you will see that his Government was actually scared of letting market forces work when it comes to providing advantages and opportunities to the most disadvantaged workers in our communities. They preferred to keep them suspended in a void of joblessness and cycle them through clearly irrelevant training programs. They seemed to distrust the ability of the private sector to structure interesting and attractive jobs to lure workers away from Job Guarantee positions. For example, the Minister claimed that the workers might never want to leave the Job Guarantee despite the fact that the private sector would be able to hire out of the Job Guarantee workforce by simply offering more attractive employment conditions. To think that the workers would never be lured out of the Job Guarantee is to display a staggering lack of confidence in market forces. Offering guaranteed jobs at the FMW can also have perverse impacts on incentives. Although you suggest that CD-JG jobs would not substitute private sector jobs, once on a Government funded guaranteed job for unlimited duration that pays the FMW, a person may not see the advantage in seeking or taking up a private sector job. Furthermore, although both the Government subsidised workers would earning wages similar to some private sector workers, it is unlikely that they would have the same attendance and work performance requirements as in a mainstream job. A CD-JG type job guarantee may also act as a disincentive for some short-term unemployed people (eg those unemployed for 9-12 months) to take up mainstream minimum wage jobs because of the guarantee of a job if they remain unemployed for a short while longer. Note: FMW = federal minimum wage. The letter really encapsulated the irrational fear that the mainstream have of these types of programs. I urge you all to refresh your memories of how palpably ridiculous the arguments raised against such policies are. The OECD is now once again enforcing the ideology though. Their confidence is returning after being battered by their failure to (a) reduce unemployment significantly during an extended growth period; and (b) failing to see the crisis coming and failing to have a policy framework that could deal with the crisis. As to their claim that there is not fiscal space left I refer you all to my introductory discussion. For sovereign nations, there is no fiscal constraint yet approaching that would prevent them from expanding their fiscal deficits and targetting a jobs rich future for their citizens. We are nowhere near the Full employment fiscal deficit condition and recent trends suggest we are moving further away from it with the consequence that things will not improve any time soon. Whenever I have raised this point in conversations with economists, they invariably think that I am joking. When I convince them that I am serious, they think the idea of holding economists responsible for the quality of their work to the point of actually jeopardising their careers is outrageously cruel and unfair. The reality is that tens of millions of people across the globe have seen their lives wrecked because these economists did not know what they were doing – or worse, had doubts but chose the safer route of groupthink. It is outrageous that ordinary workers who were doing their jobs can end up employed, while the economists whose mistakes led to their unemployment can count on job security. Dean and I share these experiences when dealing with our professional colleagues. If I was in charge of the governments that fund the OECD (particularly the US) I would take the advice from my newly created fiscal efficiency committee (an arm of the elected government) and terminate that funding that the OECD receives forthwith because it is a gross inefficiency. That would satisfy the likes of the IMF who want to eliminate wasteful public spending. Ah, but the IMF would also have its funding withdrawn and labour market programs would be offered to all OECD and IMF staff to “retrain” and become “more employable”. Min, my point is that whatever you set the nominal minimum wage to, in the long run the price level of the economy will adjust in such a way that the maximum wage will increase accordingly and there will be no real effect to the increase of the minimum wage. Chasing a median or average wage will only lead to runaway inflation. The only was I see to compress incomes is to cap the high ones through taxation. In the extreme example I gave there is no effect to the increase in the maximum income. As to whether there is any chasing, that depends upon human psychology, which is not really predictable. Chasing is much more probable without a peg, because the peg guarantees the futility of chasing.